We opened up the flower press this morning and Jessica arranged the flowers and petals from our garden face down on contact paper. We then popped a piece of card over the top to create yet another botanical creation. 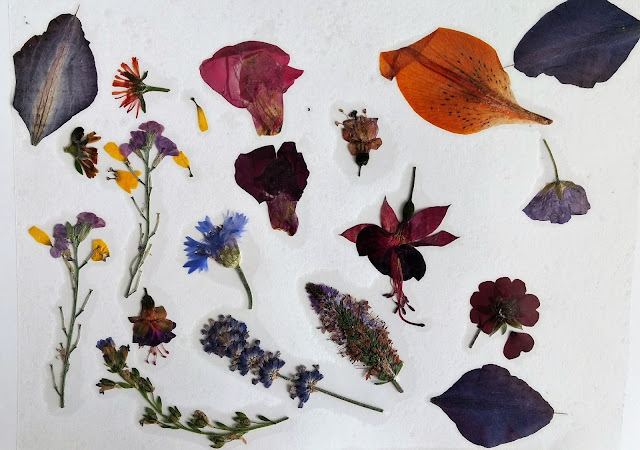 My favourites are the single petals and I think we'll use just petals next time aiming to create something like a mandala from them once pressed. They seem so delicate and press really beautifully, partly because they have less moisture than the fleshy parts of the flowers. When pressing your own flowers be sure not to overcrowd the flowers in the press. Just put two or three per layer. We use construction paper around the flowers between the layers card as this soaks up the moisture. We left them for just three days this time. This was ample time for the petals and many of the flowers but the bulkier ones like the fuchsias probably needed a week I think. I don't like using glue on our pressed flowers (reintroducing moisture) so we always use contact paper (sticky-backed plastic). We often make suncatchers from them by framing them in an aperture cut from card with contact paper front and back to seal them in. They always look beautiful but the colours fade quickly in the sun.